If you ever visit Greece, you must definitely try gavros tiganitos (fried fresh anchovies). They have nothing to do with those awful tinned anchovies. 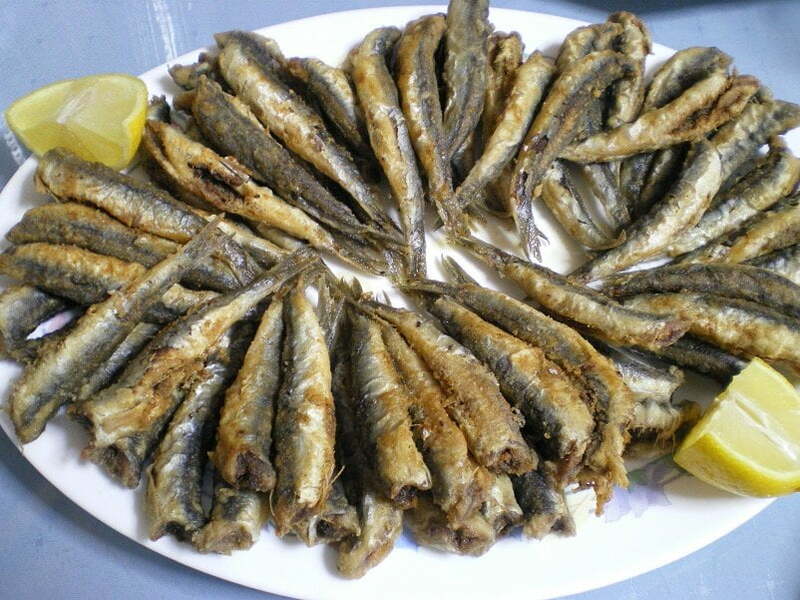 There is nothing quite as good as fried fresh anchovies and some ouzo or a glass of wine. Although anchovies are one of the cheapest fish in Greece yet they are so tasty and so healthy. You get Omega 3 fatty acids from the fish and Omega 9 fatty acids from the olive oil, which makes them a perfect meal for those having heart problems. I have memories as a child of my mother frying anchovies, her favourite fish and other similar small fish. Fried anchovies makes a simple but very tempting dish, but you need to follow a few basic rules to get it absolutely right. Anchovies do not have any scales so it’s easy to clean them. Just pull the head and most of their gut will come out as well. Remove any if left inside, wash, drain and salt them. First of all put some all-purspose flour with some salt in a zip lock bag. Put some in the bag, close it and shake it until they are coated. Continue until all are floured. In order to achieve a golden and crisp crust outside you must make sure that the olive oil is very hot when frying and not to add too many in the frying pan. The oil should be enough to cover the pan, at least 2 cm and leave the oil to heat, just before smoking point put in the fish. I know when the oil is hot enough by must putting my hand over the pan. If you can feel the heat coming from the pan, this means the oil is ready. Alternatively, if you have doubt, heat the olive oil for 3 – 4 minutes, then just put one fish in the pan and wait until you hear it sizzle and then add the remaining. When you add the first batch do not mix until they are cooked on the one side and then turn on the other. Serve them with fried potatoes (again fried in olive oil) or for a more healthy dish, with you favourite salad. My mother would always make a beetroot salad. Remove head by pulling it and the guts will also be removed as well. Wash, strain, add sprinkle with salt. Mix the flour with more salt and coat the anchovies. Heat the olive oil and fry until golden crispy. Place on absorbent kitchen paper to remove excess oil. Serve with some lemon juice. Ahh Gavrakia, I do love thee…bones and all. I eat them like french fries. I’m still looking for a fresh source of Gavro here in Toronto. My partners mother (who is Niuean) made this a little while back [while she stayed with us after the birth of one of our children] but I’m not sure which fish she used. Anyway, they were irresistible! So simple to cook and yet so tasty. We were all rushing to eat the last few. Thanks, i’ll try your recipe myself using some fresh anchovies I have gotten. That’s very interesting. I read that many Polynisean words are of Greek origin not to mention the word Polynisean itself which is a Greek word meaning poly (many) nisi (island). Anyway thanks for commenting and you can make this with other small fish like whitebait or sand smelt. Thank you for "GAVROS" recipy!